Last year I really wanted to go to YALC, otherwise known as the Young Adult Literature Convention as part of LFCC, also known as London Film and Comic Con. But, because of my anxiety and everything, it just wasn't achievable. Crowds. Talking to people. Socialising. I still very much struggle with it, but this year I've been taking more 'risks' and so, before I knew it, I'd bought three Saturday tickets for this year's YALC and off we went. I was actually asked to be on a panel, too, but I declined. 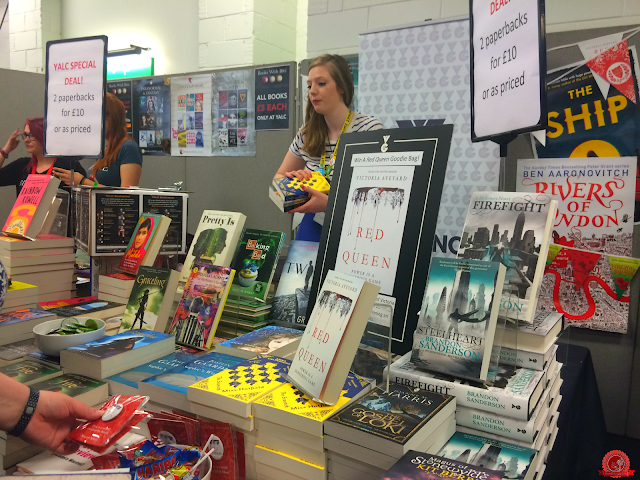 It would have been cool, but simply going to YALC was enough for me this time round! The day didn't start well, and not just because I had to wake up at 4am (gross). Long story short, I had a massive panic attack in the car, then we got stuck in traffic, then I had to completely re-do my make-up and, all the while, we were running pretty late. I ended up missing Lisa Drakeford's unofficial signing at the Chicken House stand and the YA: The Next Generation panel, but everything sorted itself out after that. This was my first ever convention and it was so surreal. When we arrived, we were queueing to get into the car park and Jim from YA Yeah Yeah walked past the window. I didn't say hello because, y'know, I was in a car and he wasn't, but BLOGGERS ARE REAL PEOPLE. That will never not be weird. 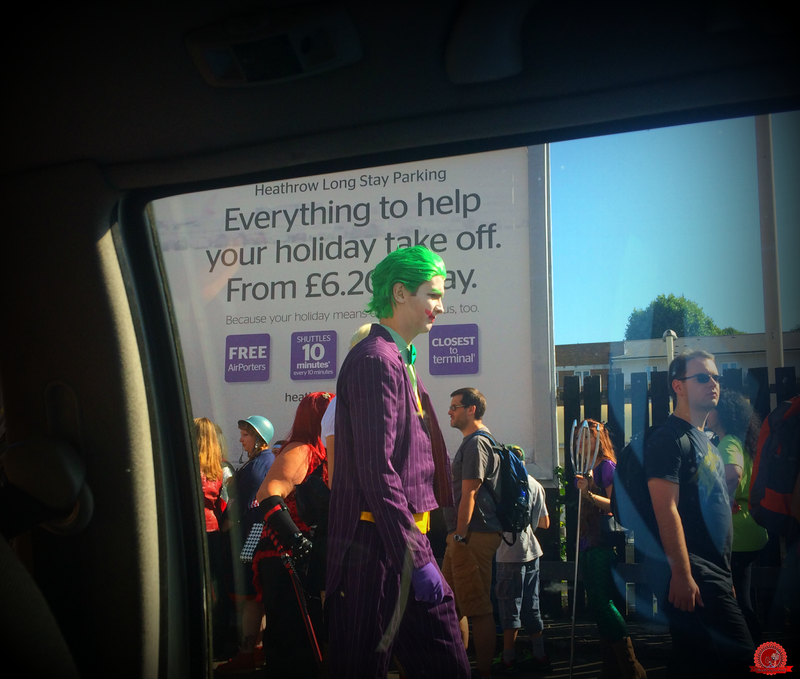 Out of my other window, Katniss walked past with the Joker. 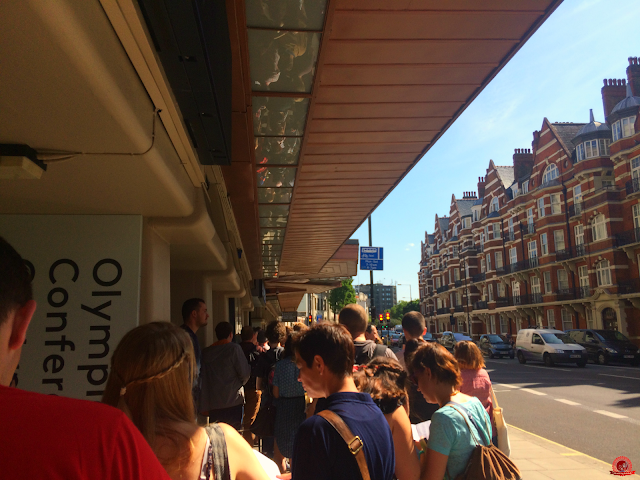 Then we queued. According to my mum, people already in the queue recognised me as I walked past to get to the end but I was in my own little world and didn't notice. If that was you, I'm sorry! After getting into the building, I made a beeline for the freebies table. Yes, you read that right. FREEBIES TABLE. 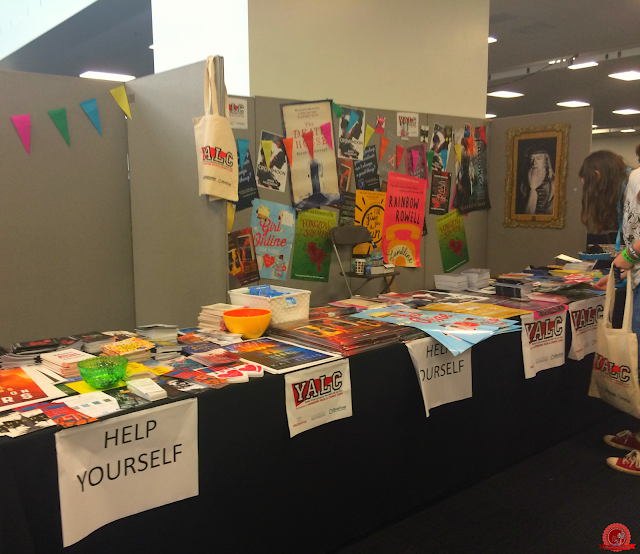 A long, long table full of postcards, posters, wristbands, badges, lanyards, sweets, bookmarks and samplers with signs inviting people to help themselves. I definitely helped myself. Yeah, that last photo isn't a shot of the freebies table. That's a photo I took at home when I was looking at all the stuff I'd got. It's not all for me, honestly! I got duplicates with a blog giveaway in mind, and I also picked up a few things for friends. 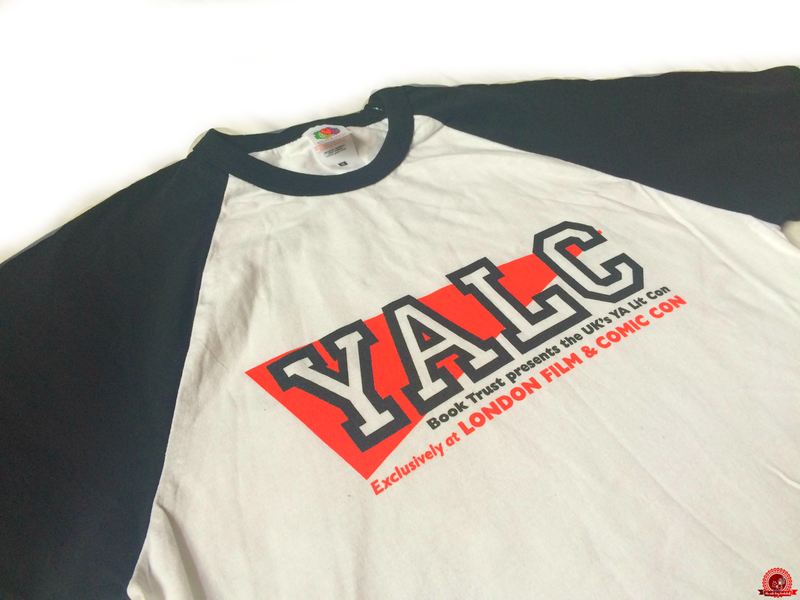 Then I headed to the info desk where I picked up my goody bag (perks of having a priority ticket) and bought a YALC t-shirt. I'd been there for fifteen minutes and already I had a bag full of stuff, a brand new tote bag, a new t-shirt and £10 less than I'd had before. 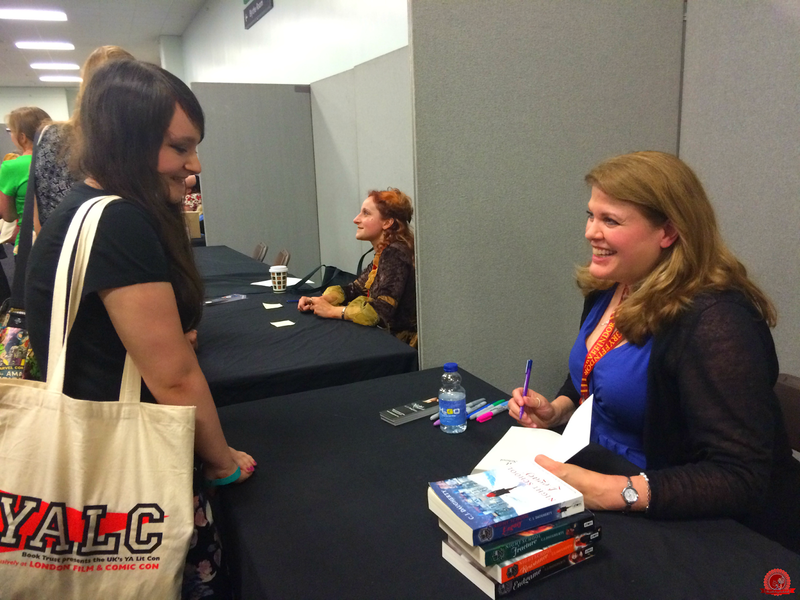 I then queued for Shadowhunters, a talk with Cassandra Clare and Sarah Rees Brennan. Next to the queue was a wall inspired by All the Bright Places by Jennifer Niven, an excellent book that you should definitely read if you haven't already. It invited people to take a sticky note and write on it the top thing on their bucket list. I loved it, and was very happy to see a lot of people wanting to write books. One thing that bugged me about the panels was that the audiences were supposed to be cleared out after every talk. Then, if they wanted to attend the next panel, they would have to queue again. 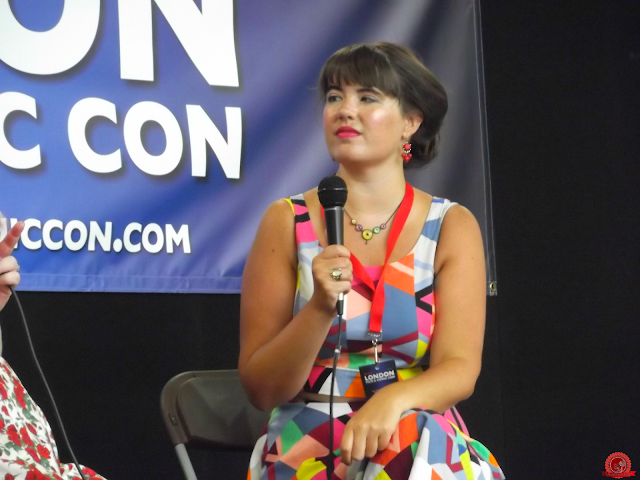 A hassle, maybe, but it was to make sure that all YALC attendees got the chance to watch the panels, and everyone had the chance to get good seats. Unfortunately, this didn't happen. When I got into the Shadowhunters panel, nearly everyone from the previous talk stayed sitting down which wasn't really fair. I'm also pretty sure that those with priority tickets were meant to be able to queue before everyone else, but that didn't happen, either. Luckily, there was one seat left on the end of the front row and I took it. I've never had such a good view at an event before! #shortpersonproblems. 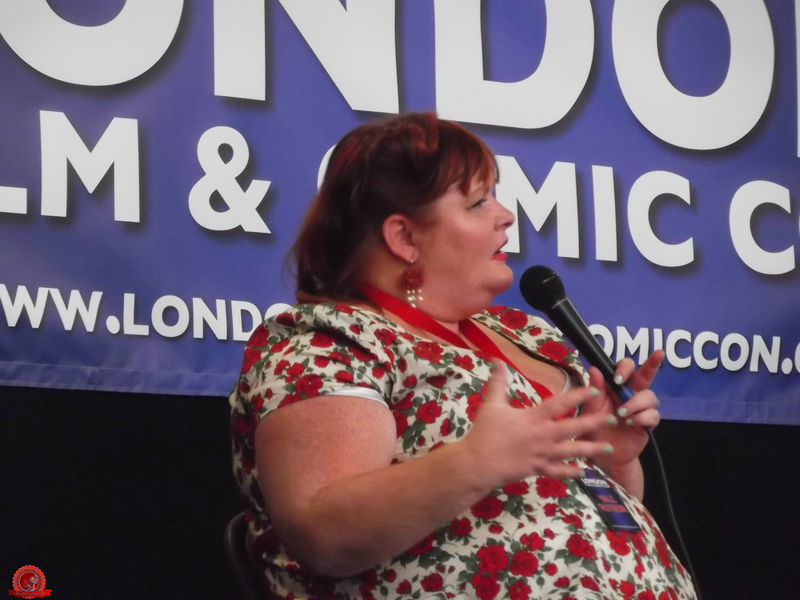 Because of where I was sat, Cassandra Clare walked past me on the way to the stage and SHE WAS SO CLOSE. AND I WAS FILMING. If you want to see that, it's in the vlog! I genuinely stopped breathing and I just... EEEEEEEEEEE. Sarah Rees Brennan had loads of photos from the Shadowhunters set which she passed around and, again, because of where I was sat, I was first to see them and SHE SPOKE TO ME AND TOUCHED MY HAND. I haven't even read any of her books but I nearly died. I was in a very excitable mood. Whilst I was in the panel, my mum was getting tickets for Cassandra's signing which was supposed to be right after the panel. This is where things got a little bit, uh, rule break-y. More on that later. For now, all you need to know is that the queue for her signing was so long that we didn't have to come back for another hour so I had a look around the stands instead. 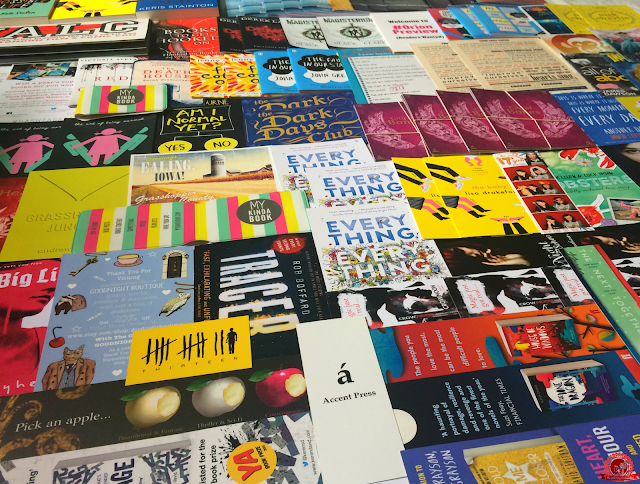 The publishers had put an immense amount of effort in, especially the team at Electric Monkey, and it was lovely meeting publicists who have been emailing me and sending me books for years. 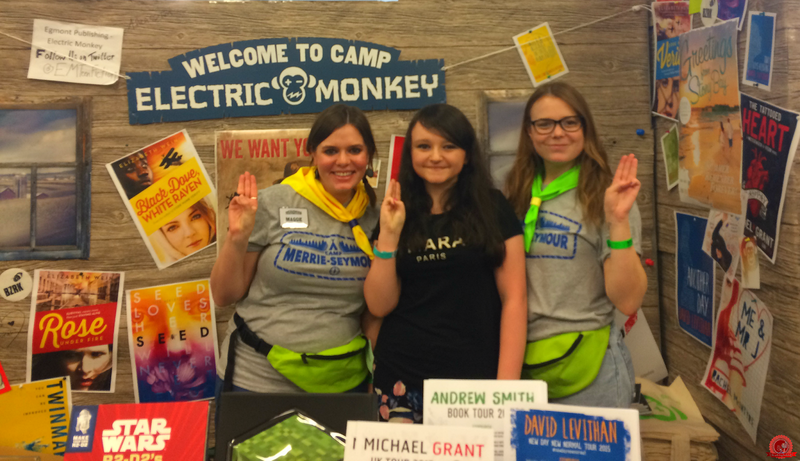 Here's me with Maggie and Emily from Electric Monkey being cool campers. And here I am with Jazz from Chicken House. It was lovely to meet these people in person, and they were all so nice! I'd missed Lisa Drakeford's signing of The Baby earlier in the day so I was happy to see some signed editions for sale. Needless to say, I got one. Then we went back to the signing area. 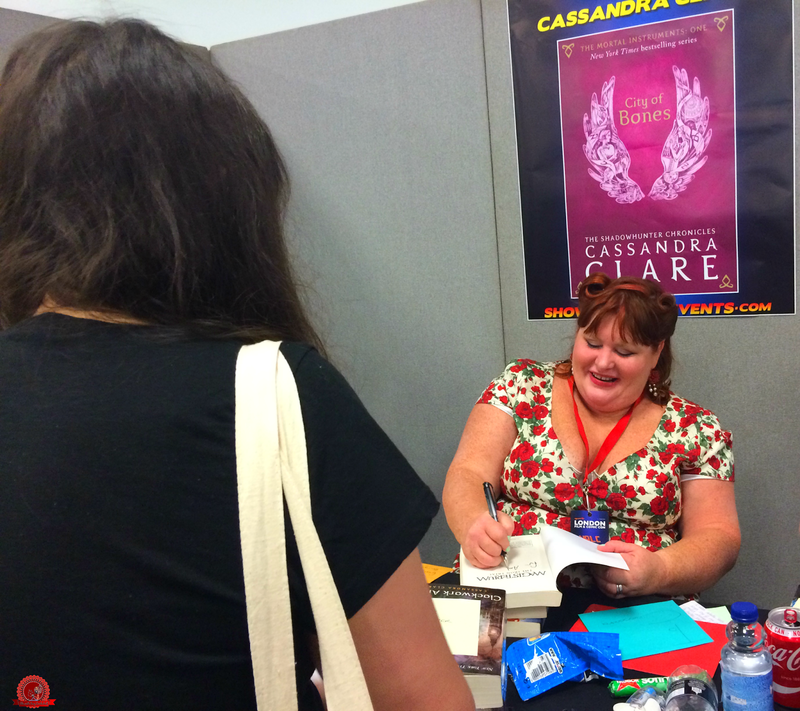 It still wasn't time to go to the Cassandra Clare signing - it was ticketed, and she was still signing for people with tickets numbered under 100, whilst we had tickets 189-191. So we got in the queue for C.J. Daugherty's signing next door - I was first! - where I met Michelle from Fluttering Butterflies and was an awkward mess. I think that's when my exhaustion piqued. Sorry, Michelle! *headdesk* Isn't her dress awesome, though? Then C.J arrived! I read the entire Night School series for the first time last week and very quickly became obsessed. They're such amazing books - my favourite series, in fact - and C.J. Daugherty is the nicest person I have ever met. If you've read previous event recaps, you'll know that a running theme at signings is that I won't say much to the author. I'll tell them my name, I'll answer any questions they ask, but that's it and it's always a bit awkward. So you might be surprised to know that me and C.J. had a full on conversation. BOOM. The below photo is my favourite from the event. It's so lovely! Then I got in the Cassandra Clare queue and bumped into Gee from The Books Bandit! I've met bloggers before, but Gee is actually the first teen blogger I've ever met which was pretty cool. Both clutching our books excitedly. This is where the rule break-y stuff I mentioned earlier happened. 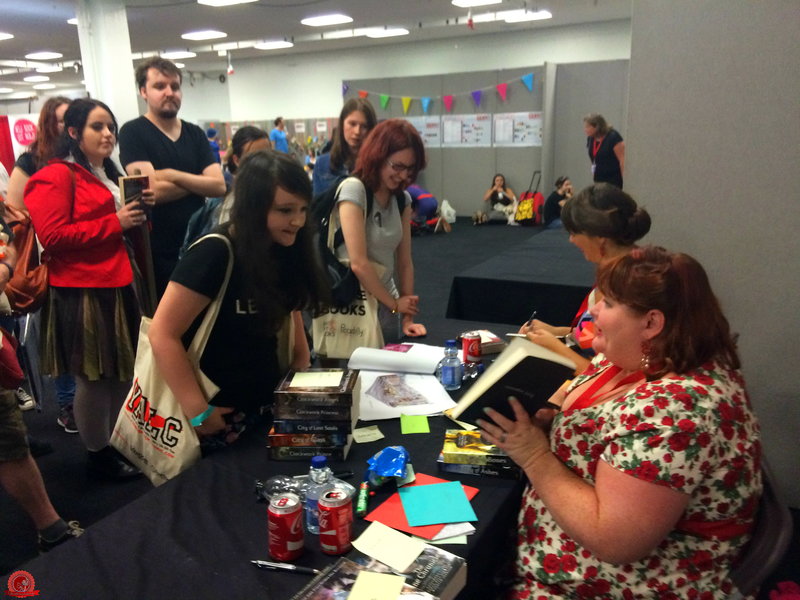 For Cassandra Clare, there was a limit of three books per person. So, uh, I took three, my mum took three and my step-dad took two. All, strangely enough, to be dedicated to a girl called Amber. Heh. This wasn't strictly allowed. Cassandra could have refused to sign them, and I wouldn't have blamed her, but she thought it was funny and was happy to sign all of them! I was so happy. After seeing my proof of Magisterium, she asked if it was mine and how I got it, so we got talking about my blog which was awesome. Two proper conversations with my two favourite authors in one day! I should probably add that when a member of the Showmasters team got wind of it when we were still in the queue, she laughed and told me it was a good strategy. So... I feel kind of bad, but at the same time I'm happy and Cassandra, her assistant and a member of the Showmasters crew were fine with it. 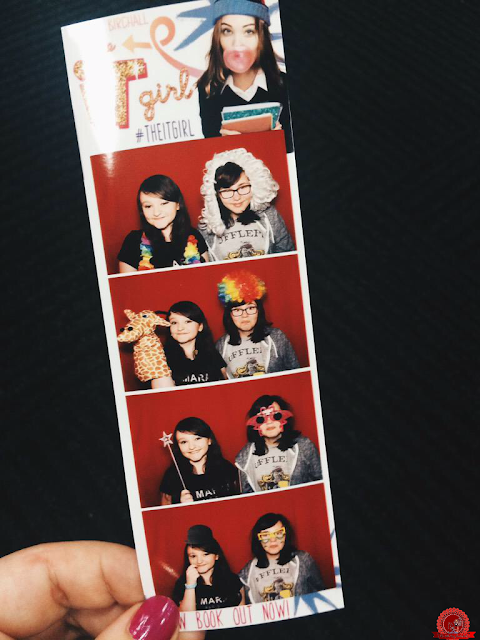 After that, I met up with Gee again and we went to a photo booth which had been set up to promote The It Girl by Katy Birchall. 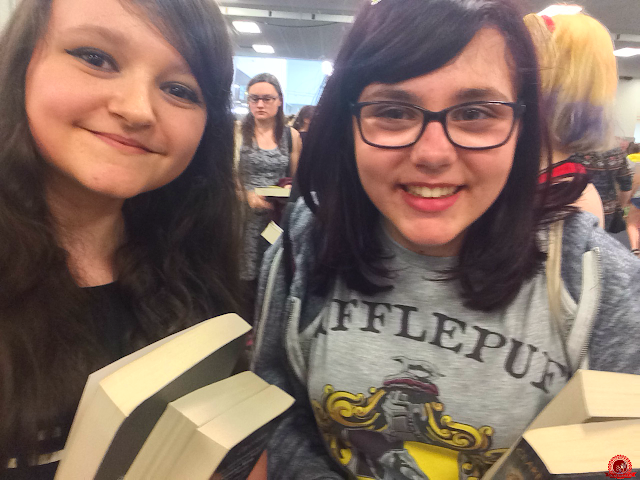 It was so fun and it was lovely to be able to hang out with her properly instead of just quickly saying "hello!" in passing. 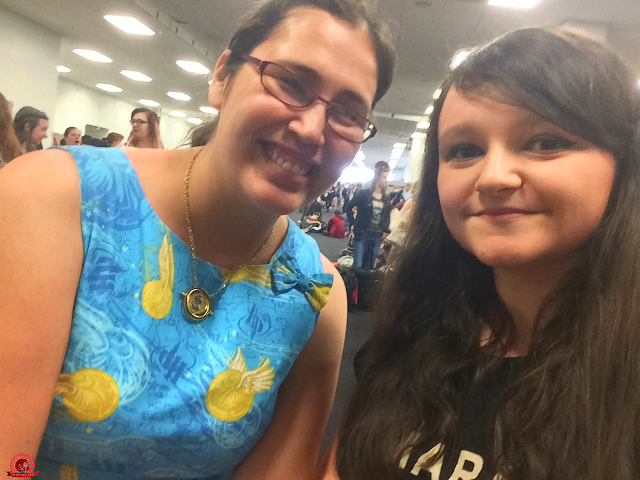 We also had a chat with Sabrina from The Delirious Reader in the queue which was nice as we'd both been at the Divergent premiere last year but hadn't had the chance to meet up. 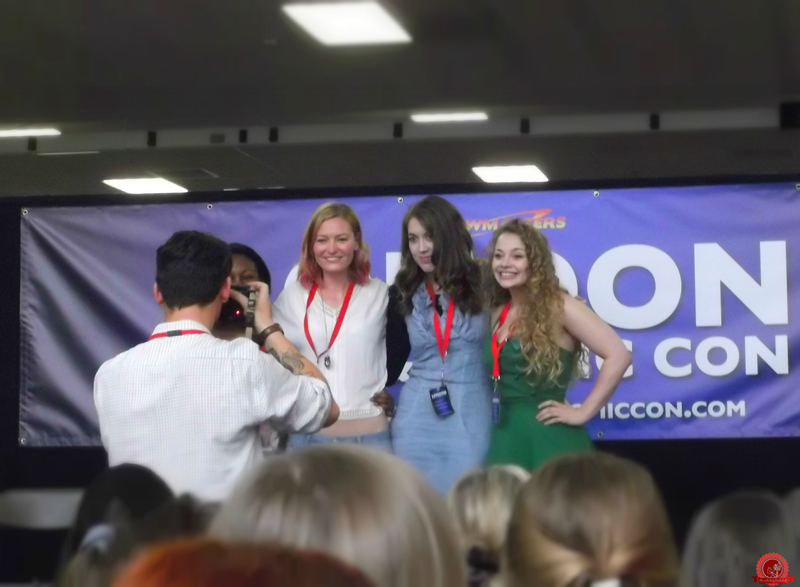 Then it was time for the panel titled Carrie Hope Fletcher's YALC Book Club, consisting of Malorie Blackman, Samantha Shannon, Holly Smale and, of course, Carrie herself. As much as I love the world of Shadowhunters, this was probably my favourite panel. It was all about writing - their tips, how they got into the profession, if they had always wanted to write - and they even gave book recommendations. After that, there was nothing else I wanted to do. I'd planned to get my proof of The Rest of Us Just Live Here signed by Patrick Ness, but I was tired and, to be honest, I wasn't all that bothered about it. So, I had one last browse around the stands and there I bumped into Anna from The Bookseller. We didn't get a photo together but it was lovely to meet her. Anna is one of the best reviewers out there, and she has my dream job. Plus, it was only a couple of weeks ago that she bought a custom typography piece from me, which you can see here. Before leaving, we went down to Level 1 to have a look at the film and comic con part and, wow, I'd thought YALC was busy but LFCC was chaos! 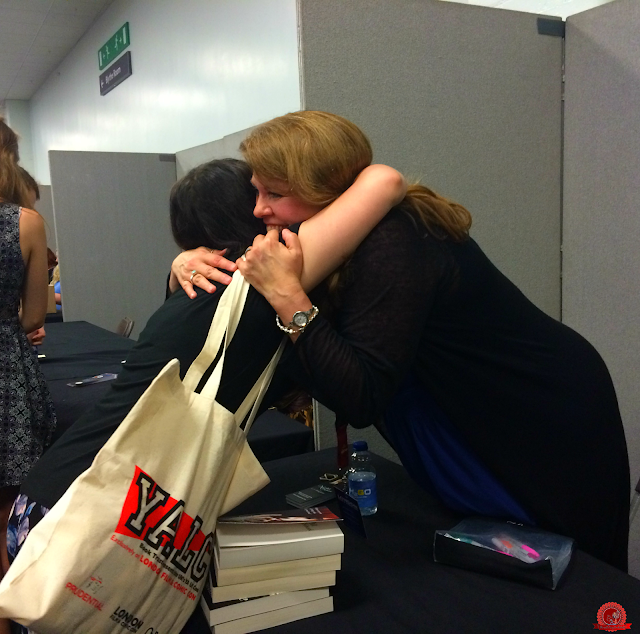 With YALC, I'd known everyone and everything and generally felt very in my element. 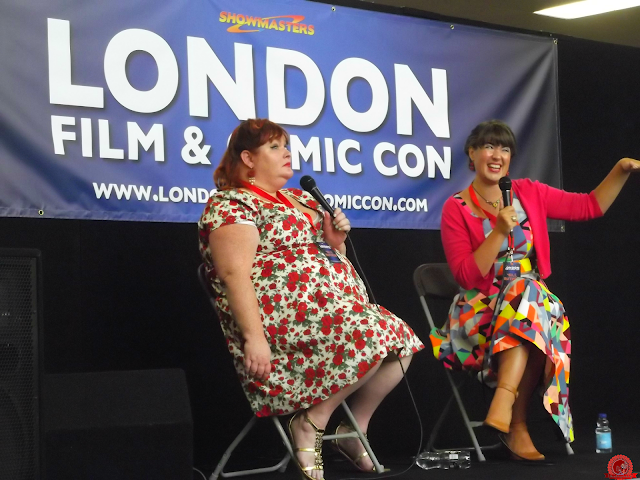 As soon as I stepped through the door into LFCC, I knew I didn't belong there and it was very overwhelming. So many film and comic references that I didn't get, so many actors I'd never heard of from films I've never seen, and so much sweat. 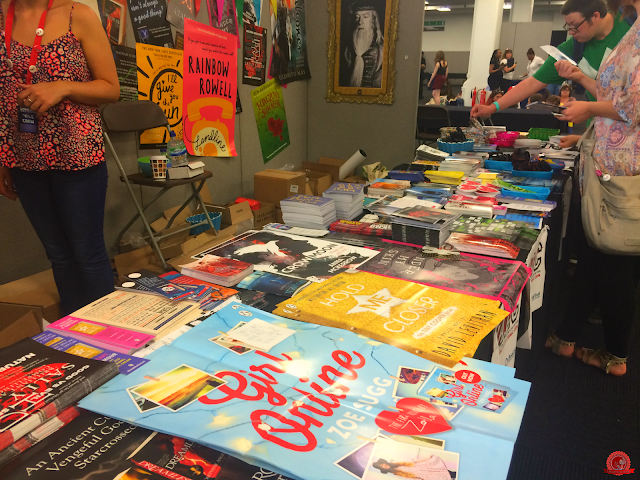 I'm sure it was awesome for people who like that kind of thing, but I'm very glad YALC was on a separate floor - the two together would have been way too overwhelming, I think. After that, we drove home - with eight tote bags full of stuff in the boot! Here are some photos I took as we drove through the city for your tourist-y pleasure. There were horror stories last year of overcrowding and overheating and I was concerned about that, but this year YALC was in a different location - Olympia rather than Earls Court - and it seemed to be so much better. Sure, there were thousands of people there but it was still spacious, there were plenty of seats in the panels - 800, in fact - and, yes, it was hot but it wasn't unbearable. Overall, it was an amazing day and it seemed to run pretty smoothly. 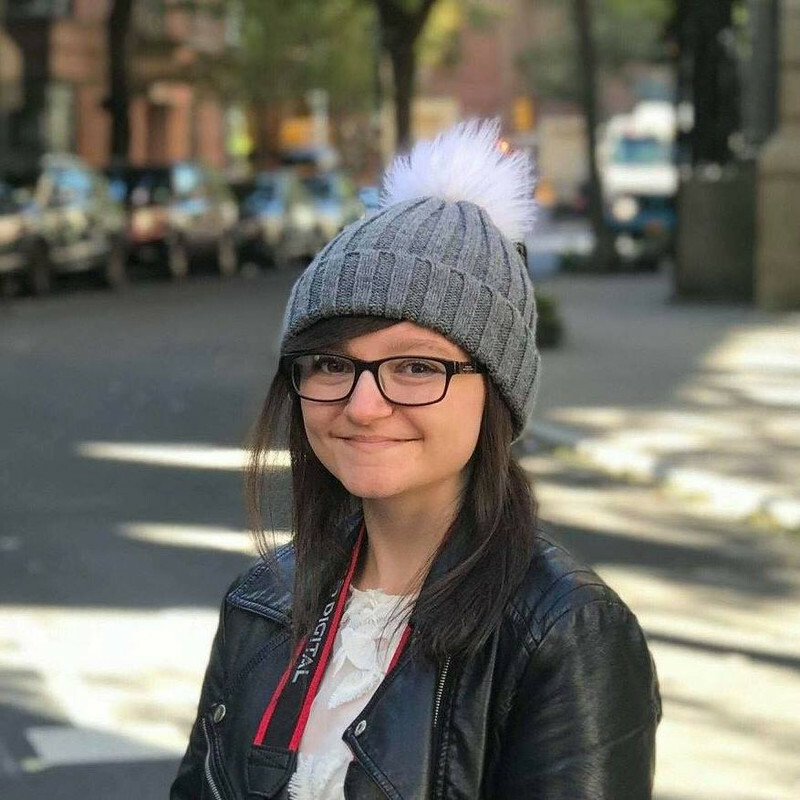 Despite having social anxiety, I actually loved meeting the people who I've only ever known online, and a couple of my YouTube subscribers found me, too, which was lovely! Plus, I met my two favourite authors ever, had proper conversations with them and C.J hugged me and I got to hang out with other bloggers. For me, YALC made me realise just how lucky I am to be a part of this community, and how magical the YA genre is. As Malorie Blackman said at her panel, we are living in the golden age of YA books. That is absolutely true. There will be a giveaway very soon in a separate post, and my vlog of the day will be up shortly. 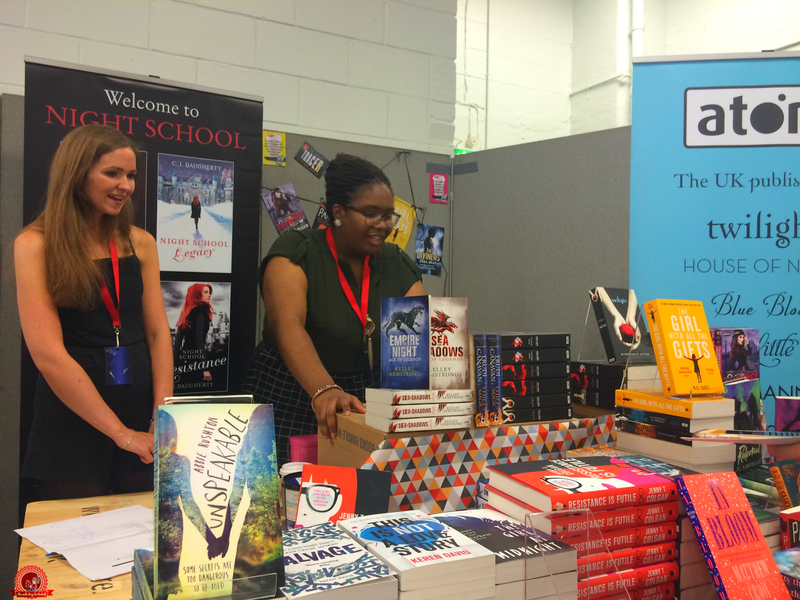 Meanwhile, I'd like to know - did you go to YALC? 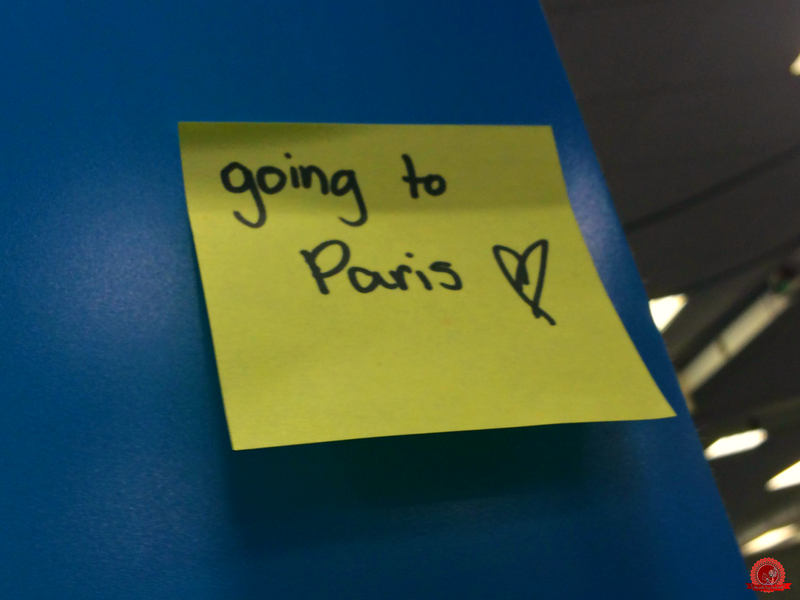 If not, are you planning to go next year? wow fab report. Im so glad you had such a brilliant time. I'd love to go but I too hate crowds and travelling into London so I doubt i'll ever get there but i've loved hearing all about it. Thank you :) Hopefully you can make it one day but I totally understand why it's difficult! Brilliant event round-up, Amber! So glad you have fun - and great that you had a fab conversation with CJ - she's lovely! Oh Amber I'm so glad that you were able to make it AND that we met, even briefly. 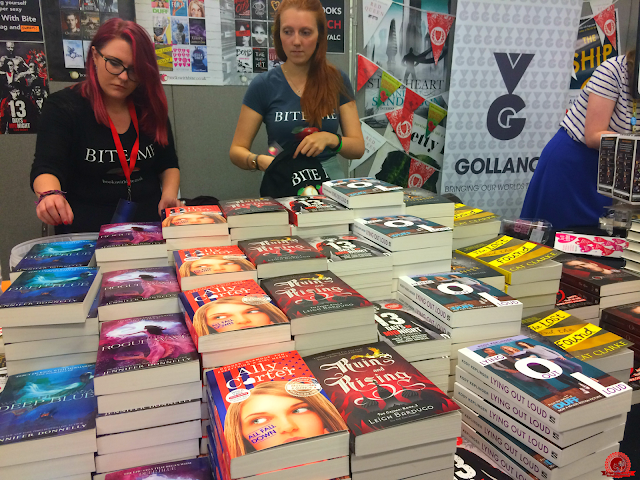 Last year at YALC, I was a mess. Anyone I didn't know wasn't allowed to touch me (which was a bit awkward because everyone wants to give everyone else hugs but I just wasn't comfortable AT ALL) and at the end of each day (this year and last year) not only was I was physically exhausted from walking around and carrying books but the act of socialising for that long was a different kind of exhaustion. I know just how you felt about walking through the LFCC levels. I totally didn't belong there either. 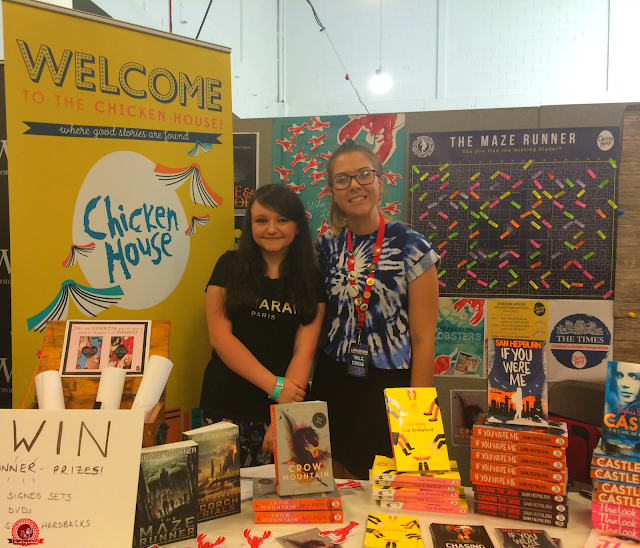 Anyway, I thought you did brilliantly coming to YALC and also this fab write-up! Thank you, that means a lot :) I know what you mean about the socialising part. As we were leaving, I said 'I think I've hit my person limit' haha. Probably met more people that day than I have in the past year! 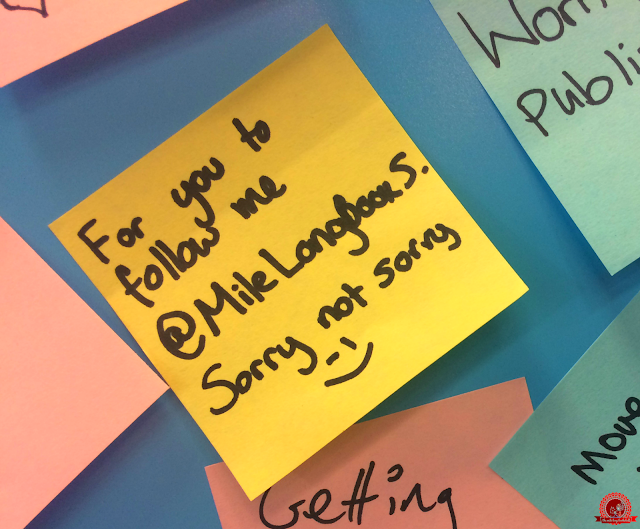 Aw, it would have been lovely to meet you! Sounds like I have a long lost twin, haha. How did you manage the entire weekend? I was practically dead by the end of Saturday! I completely missed you, I can't believe it! But glad to hear you had fun, it was awesome! Sad to have missed you! What a wonderful time you had, so glad you managed to go this year. I cant wait for next year already!! we should have more than 1 a year!! 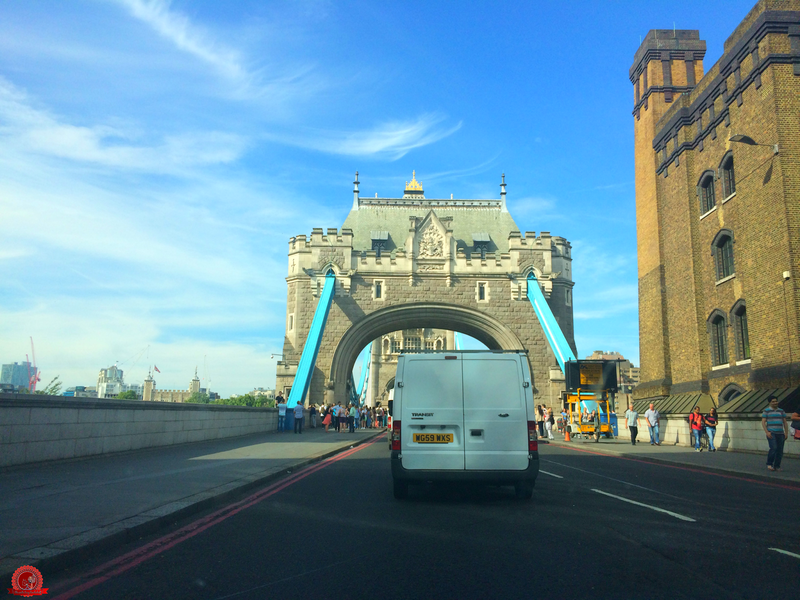 I don't think the van driver will be very pleased. Sorry? I'm not sure what you're referring to. This event looks really fantastic and I would practically die if I got to see my favorite authors! I'm moving to the UK next month and I'm really looking forward to attending the book events they hold as we don't really have any YA book events in South Africa which is a pity. 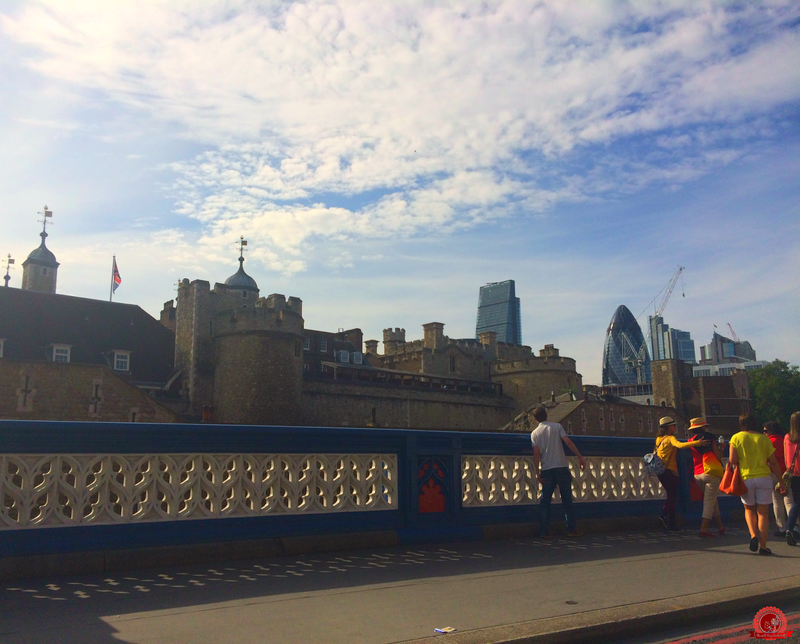 It looks like you had an amazing time - wonderful post! Ooh, where are you moving? Hopefully you can make it to YALC next year! Hi Amber! *waves*. I'm a bit of a lurker on your blog but I read all your posts! I think I may have been one of those people in the queue your mum was talking about, LOL, the back of my head is in your photo, I'm the blonde one with the plaits, hehee! This was also my first book convention and I too suffer with anxiety so I totally chickened out and failed to say hello, I wish I had! It was so weird seeing the face of someone I knew from the internet and it was the first time it had ever happened!!! I was totally overwhelmed with the event at first, but as I was there I got better and better and more chatty with people. Thank you for this post, I'm planning to go this year so it was great to get an idea of what I'm in store for! Very excited now.